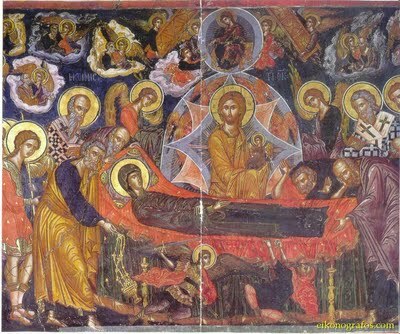 A Joyful Feast of the Dormition to All! and keep away divisions and disputes. we sing praise to your only Son.Alleluia! and rested on your breast. and gave us what is his. Saint John wrote to its people. and in August, during the time of the grapes. For the mysteries of life are prefigured in these months. angels and mortals are overwhelmed with joy. because of the glory in creation. and pour his mercy upon them. the One who sustains and rules all creation. Mary bore him, yet he bears all creation. yet she nourished him with her milk. yet he dwelt, as an infant, in her womb. sing hymns of praise to him! This entry was posted in 12 Great Feasts, Liturgical Music, Miscellaneous and tagged 2018, Dormition of the Theotokos, Maronite Dormition Hymn, Troparion of the Dormition of the Mother of God. Bookmark the permalink.